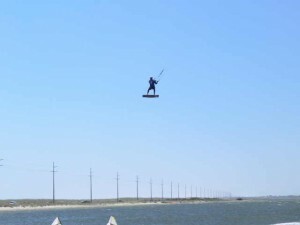 the speed of wakeboarding without needing a boat. the freedom of surfing without having to paddle out or time the waves. the hangtime of motocross – with a much longer float. 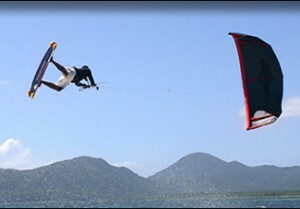 Kiteboarding, Kitesurfing or whatever you’d like to call it is fun and it’s taking off. This step is the most crucial for learning quickly – that’s why it’s mentioned first. Trainer kites are smaller and simpler than full-sized kites. They will teach you the basics on land before heading out to the water. You won’t have the distraction of the board so you will only be learning the basics of kite flying. Trainer kites are usually 2 line foil kites ranging in size from 1 to 3 meters. Go for a good size such as 3 meters. Trainer kites provide the basic knowledge of kite control and power zones of the wind window. You will need to to perfect this kite control before moving to a larger power kite. It will also save you money (and frustration) by cutting down on extra kite lessons. It’s best to get a trainer kite instructional DVD to practice your skills along with your new Trainer kite. Sports such as wakeboarding, skateboarding and surfing will all improve your kitesurfing board skills. Any experience you have with these sports will speed up your time learning to kiteboard. The benefit of having strong board skills is that now you can focus on flying the kite instead learning to ride the board at the same time. Ways to get good fast? Wakeboarding (either board or cable park). Hop on a long skateboard or mountain board and practice carving down hills. Snowboard any chance you get as this is great for improving your edge control and ability to ride switch (back foot forwards). 3. Take a Lesson – critical step! Lessons will cut your learning curve down considerably. Find a qualified instructor and they will fast track your learning and make the experience fun. He or she will be able to give you hands-on instruction for the technique and gear you will need to progressYou can learn a lot from the tutorials we have here (link) but they will not replace having an in-person lesson. Just to say it again, lessons are not just valuable – they are critical for avoiding kitesufing accidents which result in injury to yourself, others and the reputation of our sport. Using the kite instructors gear before buying a full-size kite is a smart move. You will save wear-and-tear on your gear as the first few times you will most likely crash the kite a few times. This is not a big deal with the foil trainer kites, but the bigger kites need more care. They will explain to you the differences between different kite shapes and sizes so you will know the right gear to buy. But make sure they understand the type of kitesurfing equipment that is right for you. This means getting the gear best suited for your skill level, size and kite conditions. Too many beginner kitesufers buy gear that isn’t right for them. Take some time to read through this site so you so you can get the right gear the first time. This howtokite.com site was designed by kitesurfers to provide the best information to help get you started and off the ground….literally. The purpose of this site is to give you the information you need so you will choose us to buy the kitesurfing equipment you need. 2. Strengthen up your Board skills. Learning how to kiteboard will present you with an entirely new world of freedom, intensity and sheer pleasure. Learning how to kiteboard can present challenges, but for those that get beyond the first few lessons and start riding on their own, there are endless smiles and any challenges that may have existed in the startup phase are soon forgotten. Lessons with a professional instructor present an opportunity to learn how to kitesurf in an environment that is safe and will allow for focus on the skills you’ll need to improve over time. I can’t emphasize enough how much faster you’ll progress if you’re able to learn the skills correctly the first time. Seven or eight years ago there may have been a lack of instructors simply because the sport was so new. Now, the gear has improved significantly as far as safety considerations and the instruction is top notch. Please understand that the learning process and reading about kitesurfing online or in books and magazines is not enough. Getting instruction in an environment where you aren’t risking injury or worse to yourself or others is vital to maximizing the joy you’ll get out of this amazing sport. That said, the dynamics and physics of how to kitesurf involve harnessing the power of the wind to build up enough speed to keep the rider planing across the water. After the instructor-led basic training with a practice kite, learning how to steer the kite and simulating the riding, learning figure 8 patterns, and feeling the power that a kite will generate, the next step is body-dragging. This is not as bad as it sounds, but involves the rider in the water with a larger kite and while connected to the kite with the harness, practicing the same sine (up and down) pattern in a specific direction while being pulled or “dragged” through the water. This also allows the new rider to feel what type of power the kite will be generating when diving the kite which is what will eventually pull the rider out of the water. There is a significant amount of pull required to get the rider out of the water and planing. Having a solid concept of what the kite is doing by feeling where it is and what it is doing requires practice. Learning how to kiteboard is your ticket to a truly new world. The community you’ll be a part of is friendly, open, and loves the same freedom you’ll soon experience learning how to kiteboard. awesome site – thanks for the info!